Megalopolis: Tokyo City Battle is a CGI ridefilm for the AS-1 motion simulator. It debuted in 1993 at SIGGRAPH's Electronic Theater, and is notable for being Tetsuya Mizuguchi's first project for Sega. The film, set in the year 2154 AD, simulates a futuristic flying car-chase through Tokyo. Brute Bombalez, the leader of an urban eco-terrorist gang called the 'Red Dragons', has escaped the maximum security prison Megalopolis. As Tokyo police officers, the riders must fly through the neon cityscape and capture Bombalez before he can wreak his vengeance on innocent citizens. 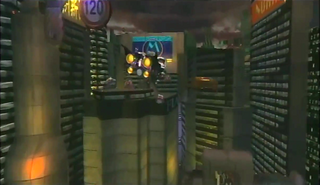 Footage from Megalopolis was re-used for the opening and ending sequences of the Japanese Sega Video Magazine series, as well as the 1994 CGI art film The Gate to the Mind's Eye, where it received a new backing soundtrack by Thomas Dolby. A port of Megalopolis was created for the Sega 32X, but never released. Given the non-interactive nature of the film, it is likely that this version was intended to be technical demo showcasing the console's graphical capabilities. Co-Art Direction/Vehicle Modelling: Buildup Co., Ltd. Copyright © 1993 by SEGA Enterprises, Ltd.